Please note: The digital edition does not include 2 of the 27 images that appear in the physical edition. Read an excerpt from the book and an interview with the author. In the years following the Civil War, a veritable army of homeless men swept across America’s "wageworkers’ frontier" and forged a beguiling and bedeviling counterculture known as "hobohemia." Celebrating unfettered masculinity and jealously guarding the American road as the preserve of white manhood, hoboes took command of downtown districts and swaggered onto center stage of the new urban culture. Less obviously, perhaps, they also staked their own claims on the American polity, claims that would in fact transform the very entitlements of American citizenship. In this eye-opening work of American history, Todd DePastino tells the epic story of hobohemia’s rise and fall, and crafts a stunning new interpretation of the "American century" in the process. Drawing on sources ranging from diaries, letters, and police reports to movies and memoirs, Citizen Hobo breathes life into the largely forgotten world of the road, but it also, crucially, shows how the hobo army so haunted the American body politic that it prompted the creation of an entirely new social order and political economy. DePastino shows how hoboes—with their reputation as dangers to civilization, sexual savages, and professional idlers—became a cultural and political force, influencing the creation of welfare state measures, the promotion of mass consumption, and the suburbanization of America. 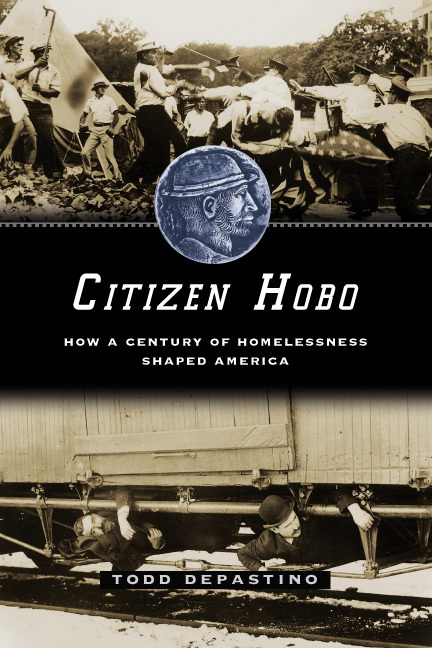 Citizen Hobo’s sweeping retelling of American nationhood in light of enduring struggles over "home" does more than chart the change from "homelessness" to "houselessness." In its breadth and scope, the book offers nothing less than an essential new context for thinking about Americans’ struggles against inequality and alienation. 1. "The Great Army of Tramps"
"From the Fraternity of Haut Beaus"
3. "Hallelujah, I’m a Bum!" "The Song of the Jungles"
5. "A Civilization without Homes"
"This vivid narrative succeeds in provoking new questions about the role of homelessness in shaping American history." "DePastino offers a fascinating look at a little-known sector of the laboring class that often did not work. In so doing he contributes to a welcome trend in which historians are redirecting attention from the workplace to the community in order to understand more fully the texture of working-class life."